The commie democrats and neo-con republicans don’t care about us or the Muslims infiltrating this country, they care only about power and money. The interests of the American citizens are not even in their scripted lies and propaganda to the American people! They don’t even mention it! 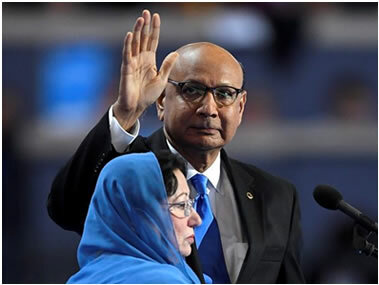 Khizr Khan caused a sensation the last night of the DNC convention when he and his wife took the stage (a stage with a wall around it), and challenged Donald J. Trump’s proposed ban on Muslim immigration. He even asked Mr. Trump if he had ever read the Constitution, and then stated that Mr. Trump had never sacrificed anything or anyone. He said that Trump has a black soul. Well, Mr. Khan, Trump’s soul is probably the purest and most Godly soul we’ve seen in a Presidential candidate in decades. I wouldn’t even venture what kind of soul belongs to Hillary Clinton or Islamic terrorists. Actions speak so much louder than words, Mr. Khan! Trump took sharp offense, saying that, "While I feel deeply for the loss of his son, Mr. Khan who has never met me, has no right to stand in front of millions of people and claim I have never read the Constitution, (which is false) and say many other inaccurate things." In previous remarks, Trump has acknowledged the positive contributions of most Muslims, while focusing on the need to fight radical Islamic terror. Of course Mr. Khan never made any mention of radical Islam or terrorists who for hundreds of years have attacked and brutally murdered innocent men, women and children and even animals. According to a recent Breitbart article, Khan claimed that terrorists have nothing to do with Islam. I have to wonder if Mr. Khan has ever read the Hadith or Quran. He also falsely claimed that the Constitution does not allow a ban on Muslim immigration, and walls on our borders are unconstitutional. The 1952 McCarren-Walter Act, motivated by concerns over communist subversion also allows for restrictions. This law was written by two Democrats and required immigrants to be of good moral character, to honor and uphold the principles of the Constitution, and to assimilate into American society. Only those who were willing to accept these conditions were allowed into the country. Mrs. Khan, is a Gold Star mother, and as such she is off limits for any comments. I find it sad that after 12 years she couldn’t have said something about her son while she was on the stage with her husband. All Gold Star mothers are highly respected by veterans as well as they should be by all Americans. Humayun S. M. Khan, posthumously awarded the Purple Heart and Bronze Star, was just 27 years old when he was killed in Operation Iraqi Freedom on June 8th, 2004 by a taxi car bomb that exploded in his base. According to the Department of Defense Captain Khan was an exemplary soldier, and served the US military with distinction. He saved the lives of those around him telling them to “hit the dirt” moving toward the speeding vehicle to intercept it. When Hillary called Patricia Smith a liar after her speech at the RNC convention, where Mrs. Smith stated that Hillary lied to her, the media and DNC colluded to besmirch Mrs. Smith. She lost her son, Sean, because Hillary Clinton and the administration refused to send much needed help to Benghazi. It is just fine for the media to attack one mother who has lost a child because of the incompetence and disregard for human life of this administration and Hillary Clinton in particular. However, because Mr. Trump intimated that Mrs. Khan didn’t speak because she’s a good Muslim wife, his statement created a whirlwind of controversy, as though he’d attacked a Gold Star mother, which is not what he was doing or saying at all. He knows full well that in Islam, women are second-class citizens, and that is what he was referring to with only her husband speaking at the convention. The double-standard is glaring and so very obvious. Hillary, whose negligence contributed to Sean Smith’s death, essentially called Patricia Smith a liar on national TV, and few in the media objected. Some, in fact, joined Clinton’s attack. And what was done to Sean Smith’s mother when she lost her son because of Hillary’s incompetence, is far worse than anything Mr. Trump has said. Just Who is Khizr Khan? Hillary's puppet Khizr Khan Believes the Constitution ‘Must Always Be Subordinated to the Sharia’. Breitbart’s article, “Clinton Cash: Khizr Khan’s Deep Legal, Financial Connections to Saudi Arabia, Hillary’s Clinton Foundation Tie Terror, Immigration, Email Scandals Together,” states that Khizr Khan has deep ties to the government of Saudi Arabia, and to international Islamist investors through his own law firm. His website was deleted because it clearly stated Khan has ties to controversial immigration programs that wealthy foreigners can use to essentially buy their way into the United States, and he has deep ties to the “Clinton Cash” narrative through the Clinton Foundation. One of his specific areas of practice, according to the deleted website, is “E2 Treaty Investors, EB5 Investments & Related Immigration Services.” He specializes in Visa programs accused of selling US citizenship. Remember that Hillary Clinton has received $25 million plus from the Saudi’s through the Clinton Foundation. Khan, according to Intelius as also reported by Walid Shoebat, used to work at the law firm Hogan Lovells, LLP, a major D.C. law firm that has been on retainer as the law firm representing the government of Saudi Arabia in the United States for years, which the Washington Free Beacon exposed weeks ago. This same firm handles Hillary Clinton’s taxes and has since 2004, and is also connected to the email scandal. They think they’re fooling us…no way. Walid and Ted Shoebat released an article on Mr. Khan, entitled, What The Media Is Not Telling You About the Muslim Who Attacked Donald Trump: He Is A Muslim Brotherhood Agent Who Wants To Advance Sharia Law And Bring Muslims Into The United States. According to Theodore Shoebat and Walid Shoebat, Mr. Khizr Khan is a promoter of Islamic sharia law and a co-founder of the Journal of Contemporary Issues in Muslim Law (sharia). In fact, in the past, Khirz Khan has shown "his appreciation for an icon of the Muslim Brotherhood" by the name of Said Ramadan, who "wrote material for the Muslim Youth Movement of Malaysia, an organization that has been promoting Islamic revivalism and indoctrination to recruit young people in Malaysia to jihadism." Mr. Said Ramadan was the son-in-law of Hassan al-Banna, the founder of the Muslim Brotherhood including Ahmad Bahefzallah, “the boss of Huma Abedin (Hillary Clinton's aide)." Should this connection give us pause? Absolutely, it should!!!!!! Despite what David Barton or Khan may believe, Sharia Law and the Constitution are not compatible. Moreover, Trump reiterated that "Captain Khan, killed 12 years ago, was a hero, but this is about RADICAL ISLAMIC TERROR and the weakness of our 'leaders' to eradicate it!" A Blue Star mother wrote a letter to Mr. Khan that was brutal in its response. Here is that letter, and it needs to be read by every American who loves freedom and liberty. Please let me know that you’ve read it! Mr. Trump is again right, and righteous! He holds us all to a higher standard for the citizens of our country. I have been blessed to get inside the Trump Organization and speak to a great number of Trump’s people. I absolutely believe this man will do everything he can to straighten out our country and bring her back to a semblance of decency. I also love Mr. Trump, because I’ve done so much research on him.